After school and on the weekends I enjoyed watching shows like Batman, Star Trek, Bewitched, I Dream of Jeannie, and my personal favourite Get Smart. My brother would also add that I was watching Lassie. Yes I admit it! Lassie was in syndication and I watched the show as much as I could. Did I mention in 1966 I was five years old? I-I-I … don’t care … I loved that dog! In the middle of the night I was once again listening to those blues. 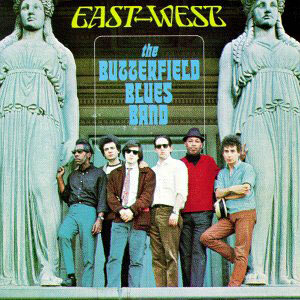 (It helped on account of that darn dog) The soulful sound of The Butterfield Band’s album East West would be softly wailing into the night. The album was never successful commercially, but it was critically acclaimed. It would be an album that would be embedded into my mind until this day. I’ve listened to it several times lately, and considering this album is also over 40 years old, it surprisingly sounds fresh and unique today. I’ve enjoyed it enough that it helped inspire this blog. Songs like Walking Blues and Work Song would stand out as another one of those songs that I heard time and time again. For a young guy, I was getting some pretty diverse tastes in music. The Butterfield Blues Band was one of those rare ensembles that were soulful, charismatic and incredibly influential. Two major players stood out as soloists in the group; Paul Butterfield, a talented harmonica player and vocalist, and Michael Bloomfield on electric guitar. On East West both get a chance to display expressive originality. The contrast between Bloomfield and second guitarist Elvin Bishop’s more traditional lick-based solos are pure magic. Butterfield and Bloomfield composed the title piece East West. This very tune would create a unique shift in music history. It was more of a jazz eastern Indian raga piece with long improvisational solos by members of the band. At this time no one heard much of the sitar in blues, but Bloomfield manipulated his guitar to create a sound that was totally unique at the time. Butterfield complimented Bloomfield with a distinctive harmonica sound of his own that felt like he was attempting to get a blues bagpipe type of effect. When The Butterfield Blues Band played at The Fillmore in San Francisco in the summer of 1966, the word spread and dozens of local bands followed in the style of East West; helping to create the psychedelic sound of Haight Ashbury. The Paul Butterfield Blues Band was revolutionary and created a sound that would help emerge as the dominant rock music of the late 1960s. This recording had a tremendous impact on the electric blues scene and the rest of the music world. If you love the blues, this is a must. It will explain so much about the influence of so many musicians and where they began. We of THE PAUL BUTTERFIELD FUND AND SOCIETY (PBFS) remained firmly committed in our resolve to see The Paul Butterfield Blues Band take their rightful place alongside their peers from the 1960’s, who along with them opened the eyes & ears of a whole generation of music lovers who thought The Blues had crossed the Atlantic with The Rolling Stones. Instead they were shown that this original American music had been in their backyard forever.